Well, I have had a chance to look over the Retiring List today and see what is being retired and there are some deals to be had if you act quickly. There are discounts on some of the products, up to 50% off! I know the 2013 - 15 In Colour Ink and Paper products are flying off the shelf and some are already sold out, so you should act fast on those items. Also on any 12 x 12 cardstock that is on the list. 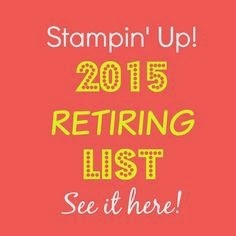 They also have a Pinterest Board, devoted to retiring products. Let me know what you want to get your hands on and we will send in an order or shop online 24/7 at my On-Line Store. In other important news, Stampin' Up! has restocked the Clearance Rack with new products - just another way to save big! Let me know if you want to order. Thanks for dropping by today. See you tomorrow with another card.